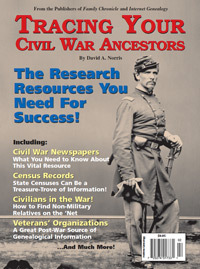 Tracing Your Civil War Ancestors; by David A. Norris; 68 pps; 8.5x11; Full Color; Item # MM004-PDF; PDF downloadable eBook, Downloads are available immediately upon placing order. This informative publication is the latest in Civil War research publications. It is authored by the same gentleman who wrote the popular Life During the Civil War. The Research Resources You Need For Success! Census Records, state censuses can be a treasure-trove of information!